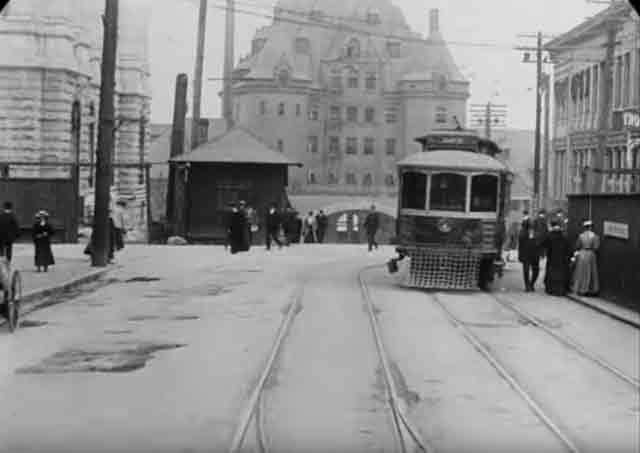 Then and Now: Sinclair Building, Vancouver, B.C. Sinclair Building at Hastings and Granville, Vancouver, B.C. Granville Street at Hastings in Vancouver, B.C. in May 1907. 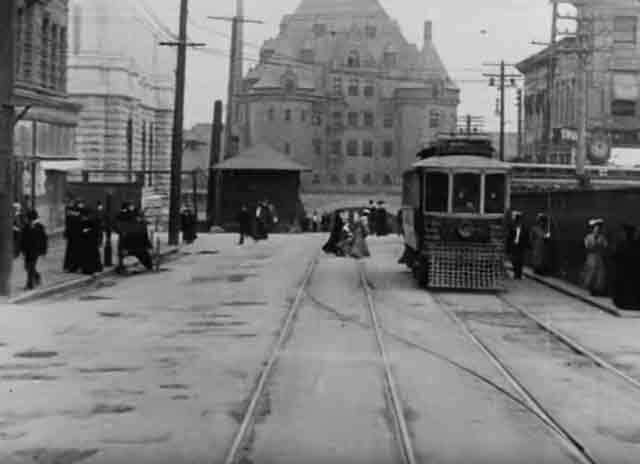 I have written elsewhere about a video taken in May 1907 of downtown Vancouver, B.C. 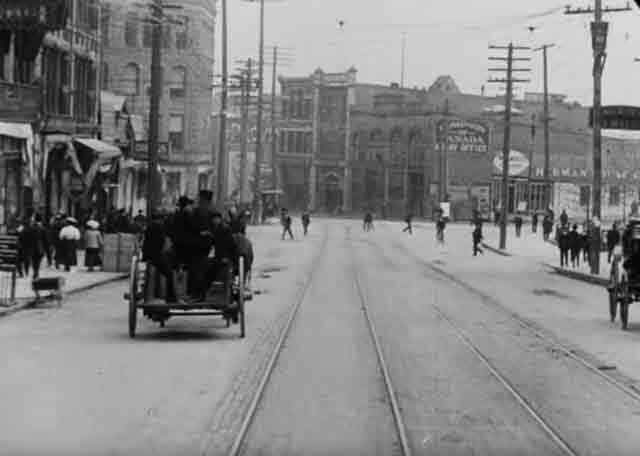 If you are interested in the video, which includes a lot more street scenes, click the link. 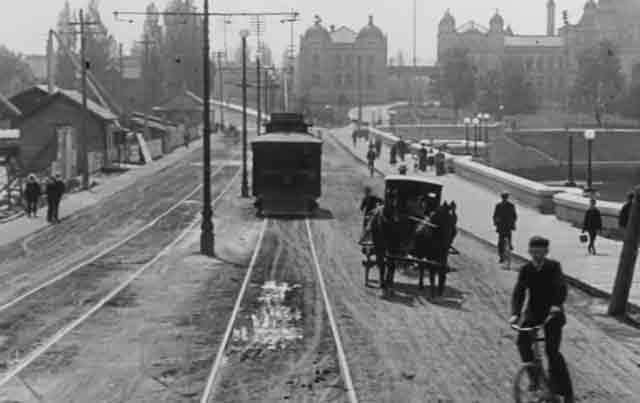 This film provides a unique opportunity to go back in time to a place that has transformed dramatically in the past hundred years. 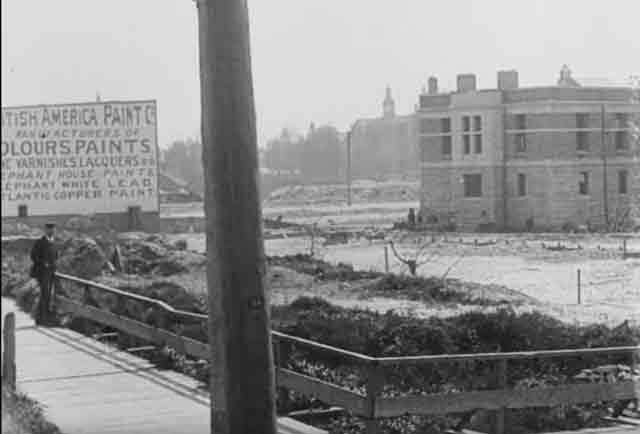 Here, we look at how the corner of Hastings and Granville in Vancouver has evolved from May 1907 to the 2010s. 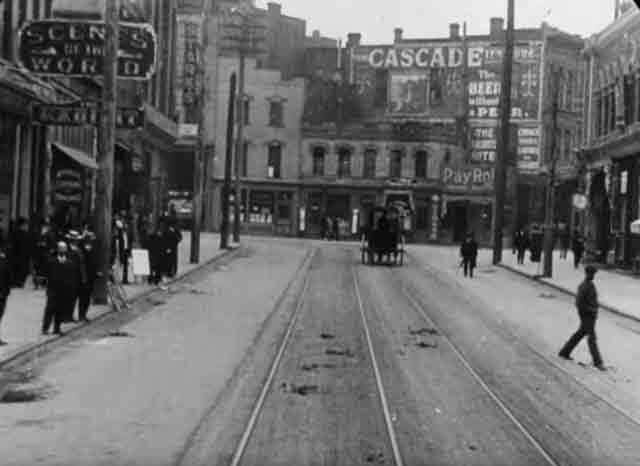 Granville Street at Hastings in Vancouver, B.C. in May 1907, just a little further north than in the above picture. It is undeniable that there have been major changes to this street corner. The trollies are all gone, of course - but remnants undoubtedly still linger under the asphalt. The large building in the center is gone, which is a pity, as it is a classic of Victorian architecture. Let me point out something a little more subtle that has changed dramatically. In the shots above, there's something you are bound to overlook that isn't present nearly as much. What is that? People. Yes, there are a couple of people here and there in the recent shot below. 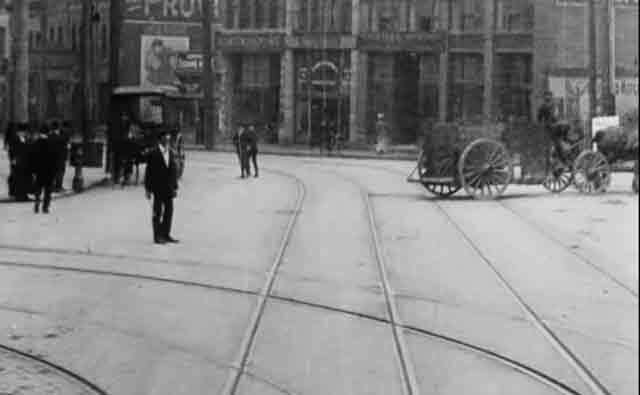 However, look how many there are in the 1907 shots! They are everywhere. Women wearing bustles, men wearing suits, everyone hurrying here and there. In the recent shot, by contrast, there are some people, but they aren't nearly as numerous, and they aren't dressed up at all. They don't look in any hurry, and they most definitely are not seen in the street. 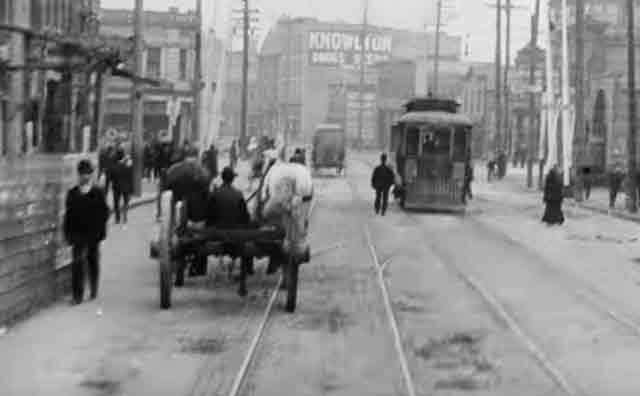 The change is not because there are fewer inhabitants of Vancouver - it is many times larger now, and this remains a key downtown area. Instead, the change simply reflects different patterns in how people live. This is a very significant but almost unnoticeable change over the past hundred years - people no longer inhabit these public spaces as they did. There are still people around but they are in buildings or in cars or otherwise not commingling. Society has changed, people are not in as close proximity to each other as they used to be, public areas are desolate. Food for thought, these dramatic changes happen and we don't even notice. Now, as to what is still similar between 1907 and the 2010s, it turns out there are several things. 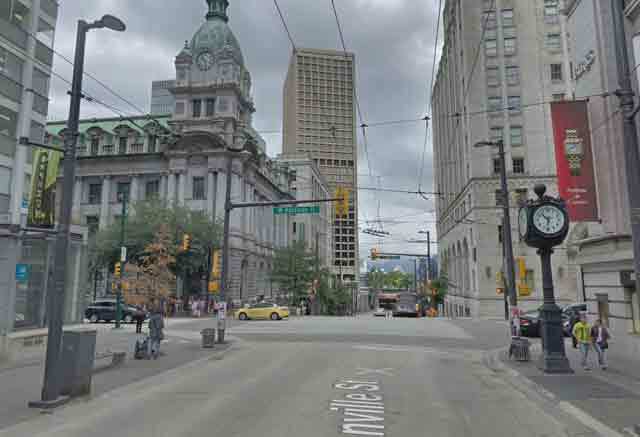 For one, the street orientation is unchanged - there is West Hastings intersecting with Granville the same as always. 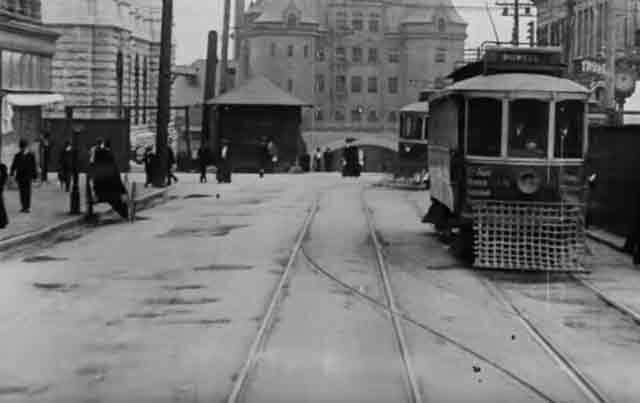 Oh, and what's that building on the far (northwestern) corner on the left? 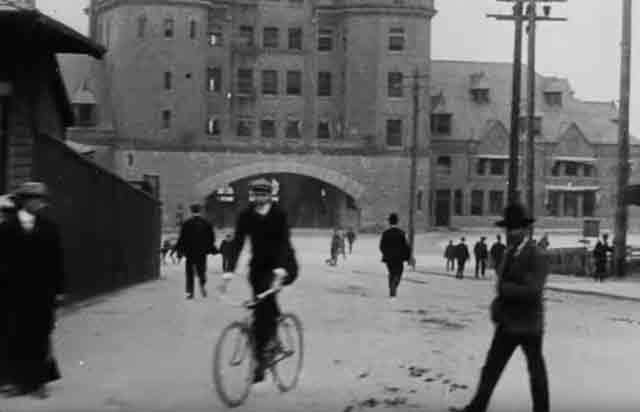 Why it's the Sinclair Building! Actually, it is not yet completed in 1907, having been begun in 1905. It would take a few more years to complete and house the post office until 1958 when it was largely replaced. Today, this handsome building is part of Sinclair Centre, a large mall. Is there anything else left from 1907? Why yes, there is. In the recent photo below, notice that clock on the right (southeastern) corner. If you look closely at the top picture above, there it is on the right behind the trolley, with only the top visible. There also are wires overhead, some things never change. Anyway, I hope that you enjoy these trips back in time as I do. Thanks for visiting this entry in my series of the more things change, the more they stay the same. 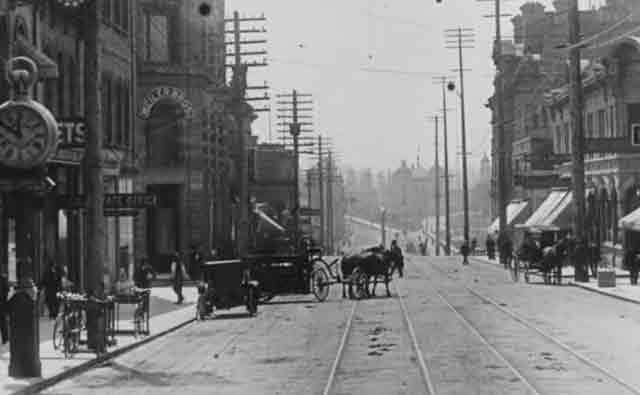 Granville Street at Hastings in Vancouver, B.C. in the 2010s (courtesy Google Street View). 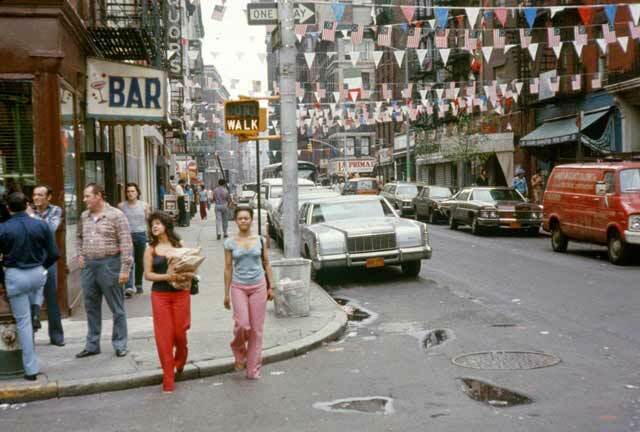 Second Avenue at 51st Street circa 1980. The above ordinary street scene from the Turtle Bay area of Manhattan piqued my interest regarding that particular street corner looks like now, in the 2010s. I tracked down the location as the southwest corner of Second Avenue at 51st Street. 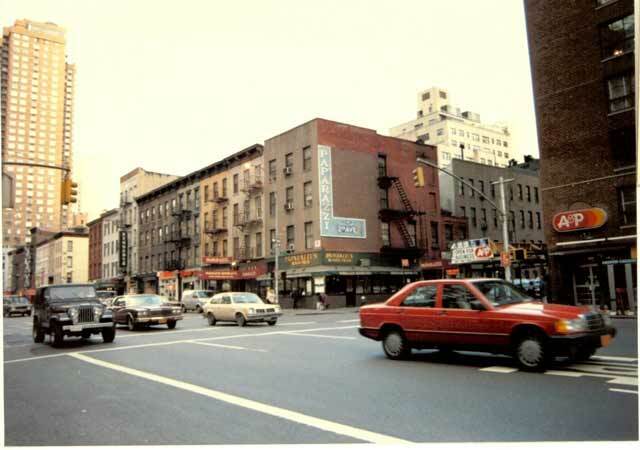 So, I decided to do a comparison of Second Avenue at 51st Street from around 1980 to the 2010s. 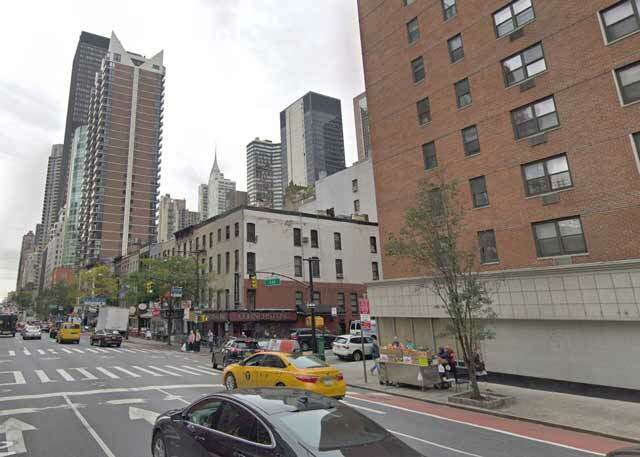 Second Avenue at 51st Street in the 2010s (Google Street View). The first thing that I noticed is that the A&P on the northwest corner is gone. The Great Atlantic & Pacific Tea Company already was in trouble in 1980, and it began a wave of store closings in 1981. The company stumbled on for another few decades, with moments where it seemed to be regaining strength. However, the 2009 recession hit A&P hard - why is unclear, since supermarkets should be relatively recession-proof, but the company was highly leveraged after various acquisitions - and it filed for bankruptcy in 2010. This seemed to save the chain, but then it filed for bankruptcy again in 2015 and closed all of its remaining stores by the end of that year. Considering that the location is closed in the more recent photo, this A&P may have lasted until the end of 2015. The new tenant is a CVS, which reflects an influx of pharmacies into old retail spaces. Prescriptions are a durable and growing business. People aren't cooking at home as much as they used to, either, so the switch is a sign of the times. The buildings on the southwest corner and running down the block appear to be the same. However, they have had a lot of work done to them. The building on the corner has had windows added on the 51st Street side. The fire escape also is gone. The other buildings along the block nearest that corner also have removed their fire escape, and only a couple of those buildings down by 50th Street retain them. Personally, I like fire escapes, because they give a building character. However, I can certainly understand why you would remove them because they must be maintained and can provide entry for prowlers. The low buildings almost certainly still survive as they are by selling their lucrative air rights to those new skyscrapers behind them. When I first glanced at the most recent picture, I thought that the tall apartment building down Second Avenue was the same. However, a closer look showed that it was not the same building at all. Whatever building was there in 1980 was replaced in 1985 by Sterling Plaza, located at 255 East 49th Street by developers Fred Wilpon and Saul B. Katz. Why they felt the need to replace the building that was there in the oldest photo is unclear, but the 1980s were a period when tax incentives spurred a lot of building in Manhattan. This surge in construction peaked in the 1985-1986 period. The absence of Sterling Plaza dates the top photo to before 1985 for certain, and probably before 1984 or even 1983 considering the typical length of time of demolition and construction. Sterling Plaza, incidentally, now is one of the top areas to live in the area. Overall, this particular block hasn't changed much at all. You still have the low-profile line of buildings and a sea of taller ones around them. Zoning laws have made this block a sea of stability, the eye of the hurricane of new construction all around it. Thank you for visiting this entry in my "the more things change the more they stay the same" series. I enjoy putting these together because I'm as curious how these areas change as you are! Second Avenue at 51st Street in the 2010s. 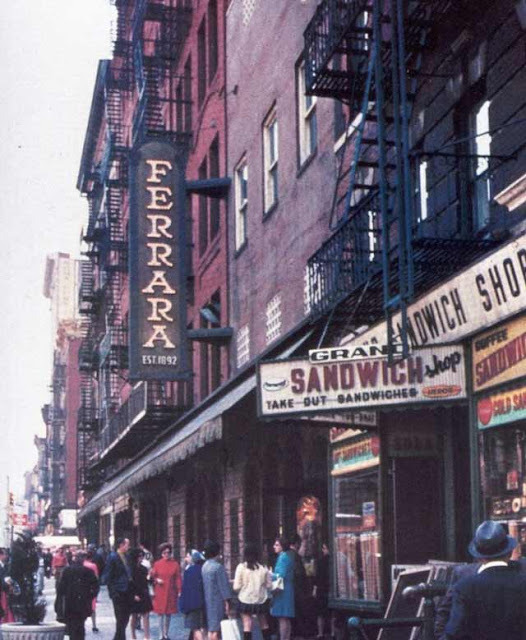 Ferrara Bakery on Grand Street in Manhattan during the 1970s. It is common to think of New York City as a place where things are transient. People come and go, businesses come and go, buildings come and go. However, there is a lot more permanence to the Big Apple than perhaps some folks realize. This isn't due strictly to preservation laws, either, though they certainly contribute. Instead, there is an institutional orderliness in Manhattan which maintains places that serve a need. A business doesn't have to be particularly unique - it may just be another local diner or steakhouse or deli when it opens. However, some of them have that special ingredient that stands the test of time. This isn't a judgment call or a review or anything like that, it is simply fact: some joints last seemingly forever while most are gone within a few years. One of the lasting places is the Ferrara Bakery at 195 Grand Street between Mulberry & Mott Streets. I came across the above old photo of the Ferrara Bakery from the 1970s and became curious about what the site looks like today. So, I went on Google Street View and did a comparison of Ferrara Bakery between the 1970s and the 2010s. The resulting recent photo is below. A little research soon showed me that Ferrara Bakery was established in 1892. That doesn't make it the oldest local business in Manhattan by far, as there are restaurants such as The Old Homestead Steakhouse and Kenn's Steakhouse that originated in the mid-1880s that I can think off the top of my head that are older (and I would place good odds on some other businesses being older than them, too). The old joints all play up their venerable status one way or another - if they can't claim to be the "oldest," then they are the "best known." Nothing wrong with that - as the Jack Nicholson character said in "Terms of Endearment," we all use what we can. Ferrara's claim to fame, aside from being around since before anyone alive today was born, is that it remains in the same family after five generations. It claims to be the first Pasteria and Espresso bar in "America." I'm not even sure what a Pasteria is - I'm sure it sells pasta, but only pasta? - but I'll believe them. Who's going to check? In any event, they've been doing something right, that's for sure. Antonio Ferrara and Enrico Scoppa opened Café A. Ferrara in 1892. 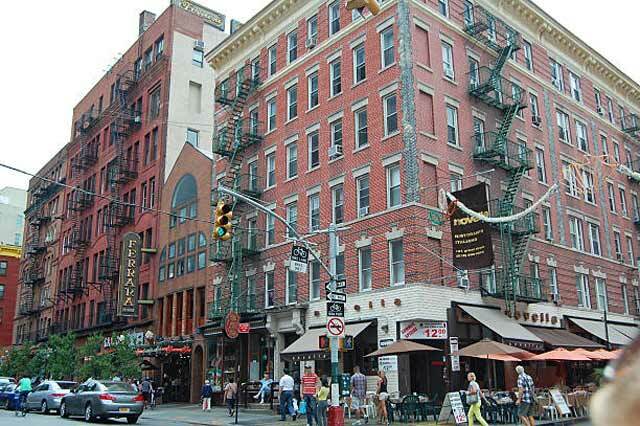 That section of Grand Street is in the heart of Little Italy. So, location, location, location being the first rule of real estate, placing your Italian bakery right in the heart of what has become a venerable institution within New York City devoted to your restaurant's tradition was either serendipitous or extremely shrewd planning. Ferrara's now is surrounded by other Italian bakeries and similar joints, of course, but there's only one Ferrara Bakery. The area gets a lot of foot traffic from tourists and locals alike, and that's exactly what a bakery needs to survive. People who want to see Little Italy because everyone knows about Little Italy are going to stroll by, see something nice in Ferrara's window, and stop in Why not? It's an authentic piece of Little Italy and the immigrant experience. A comparison of the 1970s photo with the more recent one shows that little has changed in 40+ years. The Ferrara sign appears to be the same, as does its building - although the facade has been drastically updated. Call me a traditionalist, but I preferred the original facade. It's probably a lot nicer inside now, though. Stepping back a bit, this photo shows Ferrara Bakery in perspective. I still don't like that new facade. Looks like they change the bushes out front with some regularity. The other buildings on the block also are the same. Getting anything changed on that street probably requires multiple approves from people who have no interest in seeing a historic area change, so that is not too surprising. Ferrara's must have had some pull to get their renovation permits approved. Overall, the area looks a bit classier than it did in the 1970s. Gone are the low-rent sandwich shops and so forth. Now there are perfectly manicured potted plants out front and everything looks nice and tidy. The fire escapes are still there to give the area that authentic look of the Lower East Side. There has been some change, but it has been subtle and tasteful - just like Ferrara's mini cannoli. Anyway, I hope you enjoyed this entry in my "the more things change the more they stay the same" series. Check out my other offerings, I love looking at how neighborhoods change - and don't change - over time. 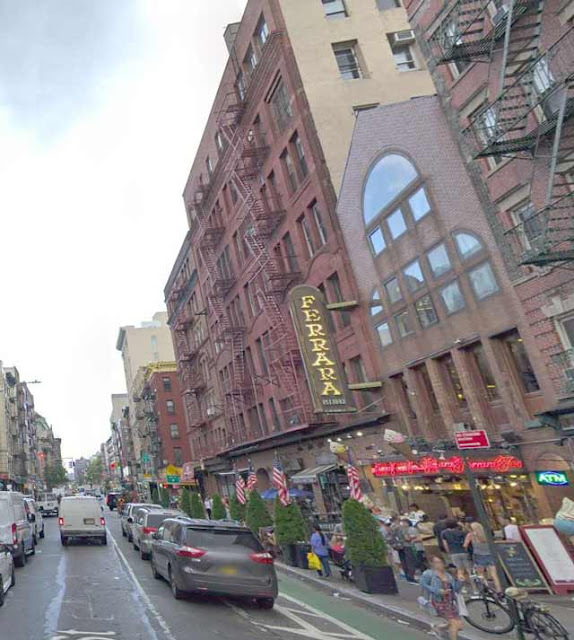 Ferrara Bakery on Grand Street in the 2010s (Google Street View). 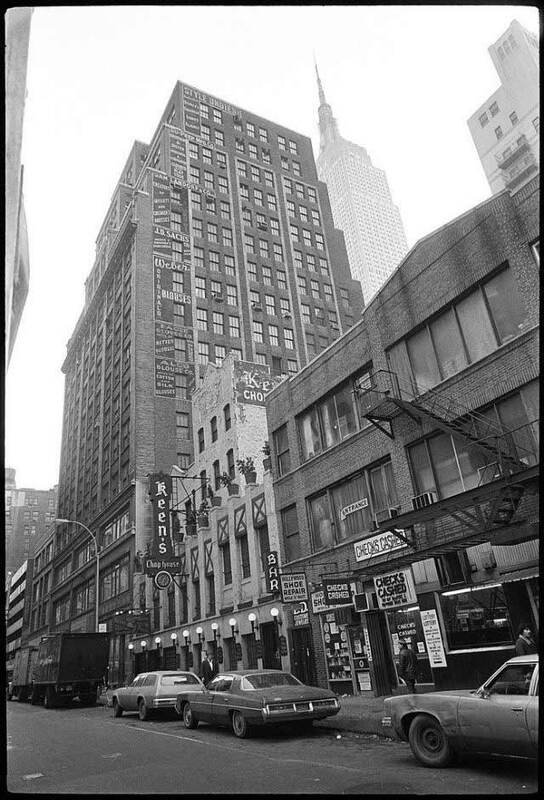 Keen's Chop House, 1976 (Chris Protopapas). Chris Protopapas, a Greek immigrant, began taking photographs of ordinary street scenes in New York City in 1974. He took the above photo of Keen's Chop House at 72 W 36th St, New York, NY 10018 in 1976. It's an interesting composition with the Empire State Building looming in the background - which was likely why he took the shot - so I became intrigued. 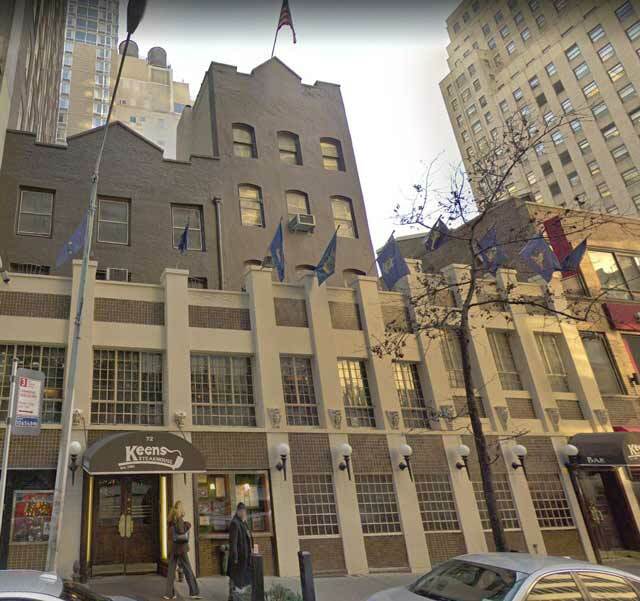 I decided to do this comparison of Keen's Chop House from 1976 to the 2010s and see what the location looked like now. Well, my research quickly showed that Keen's Chop House remains very much in business. 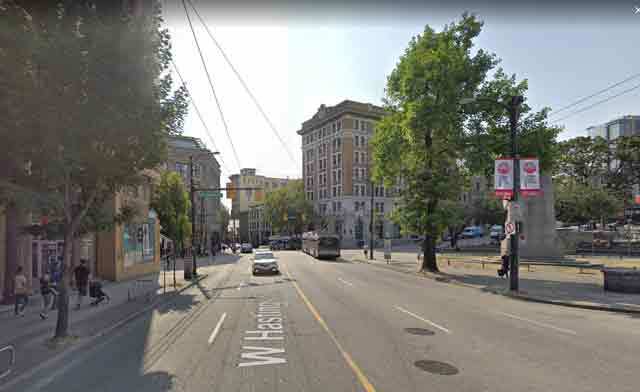 In fact, the entire block looks the same, as you can see in the Google Street View photo of the same area in the 2010s. None of the buildings on the block has been replaced, though their facades have been subtly altered in places. This is one of the most unchanged blocks I've found in midtown, in fact. You know, of course, that the Empire State Building is still there. Unfortunately for our comparison picture, a building on 35th Street now blocks it from our vantage point at the intersection of 36th Street and Sixth Avenue. However, if you look very carefully at the photo at the bottom, you can just see the very tip of the Empire State Building's television mast just above the intersection of the two buildings in the background. A building has to be tall to be able to have any part of it still be spotted from this extreme angle above those tall buildings. If you were unfamiliar with the area, however, you'd never even notice it until you walked down the block and saw its massive presence. Keen's Chop House (Google Street View). Keen's (now called Keen's Steakhouse because the term "Chop House" has gone out of style) opened in 1885. That was the golden age of steak restaurants, places for the wealthy. Lüchow's on 14th Street was another well-known example. While Lüchow's closed in 1984 and its building was demolished in 1995, Keen's survives pretty much exactly as it was decades ago. It has become a tourist attraction in its own right, boasting 90,000 clay pipes which it calls the largest such collection in the world. Other than Keen's, the entire block seems like it is caught in a time warp. The street lamps, one of which you can clearly see in the 1976 photo but which is obscured by the dark background in the photo below, are still the same. The fire escape on the 5 Boro Burger building at 80 West 36th Street is still there, none the worse for wear after more than 40 years, though they have removed the little ornamental cornice on that building probably because it deteriorated with time and became a hazard. Anyway, thank you for visiting this installment of this series showing that "the more things change, the more they stay the same." I hope you enjoy these little history excursions as much as I do putting them together! 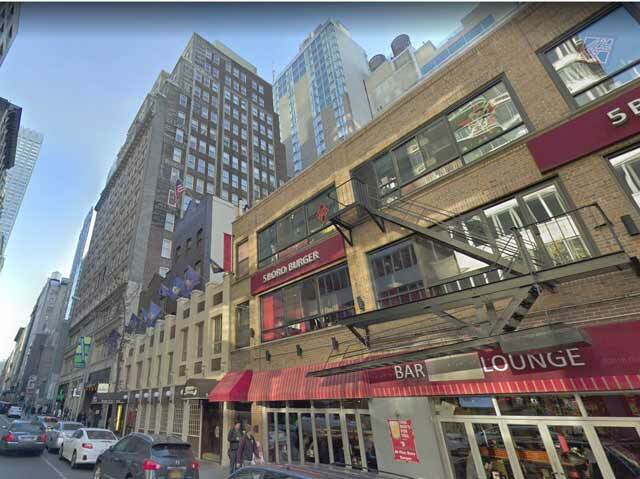 The same vantage point of Keen's Steakhouse on West 36th Street, Manhattan today (Google Street View). 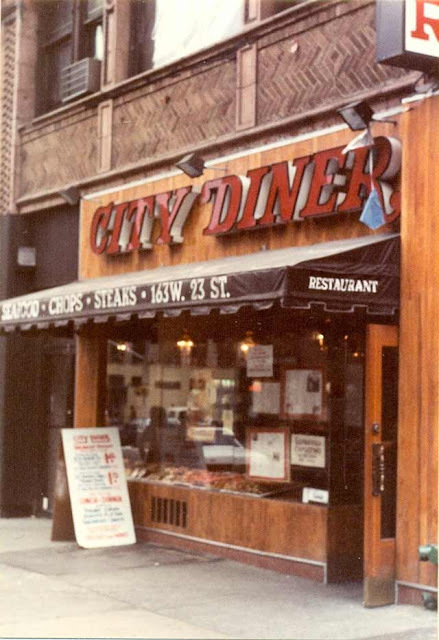 City Diner at 163 West 23rd Street, Manhattan around 1980. When you live in the city, little joints that the world seems not to notice loom large. If you find a good local diner, for instance, you treasure it. You get to know the workers, they get to know your name, you learn what days they have certain specials, little oddities like whether they sell cheap bagels at 8 a.m. on every other Thursday - that sort of thing. Then they move, or you move or you lose track. Well, let's make a comparison of City Dinner at 163 West 23rd Street, Manhattan from the 1980s to the 2010s and see what happened to that location. I never know what happened to a particular location before I start researching it. It could be completely different, with no remaining reference points at all. However, although City Dinner is no longer at 163 West 23rd Street, the spot hasn't changed much at all in the intervening decades. While you may be wondering what is so special about some old diner, there's a hidden story to City Diner that you may find as interesting as I did. City diner opened around 1978 in a brick building that had once been home to the Traffic Cafeteria (the building still bears the name). 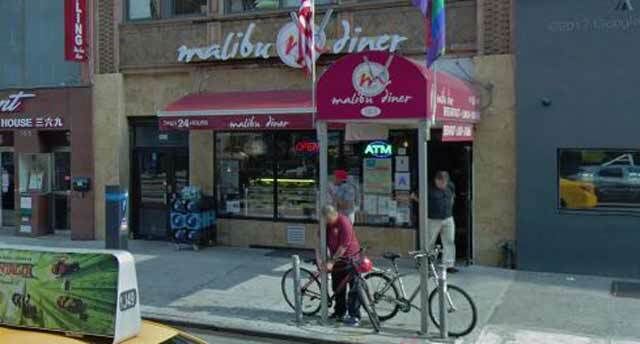 It became the Malibu Diner in 1981, though ownership appears to have remained either unchanged or little disturbed. So, as of this writing, Malibu Diner has been there for four decades. That's enough time to build up a wealth of expertise in how to please your customers. Malibu Diner in New York. (Photo by Malibu Diner Facebook page). 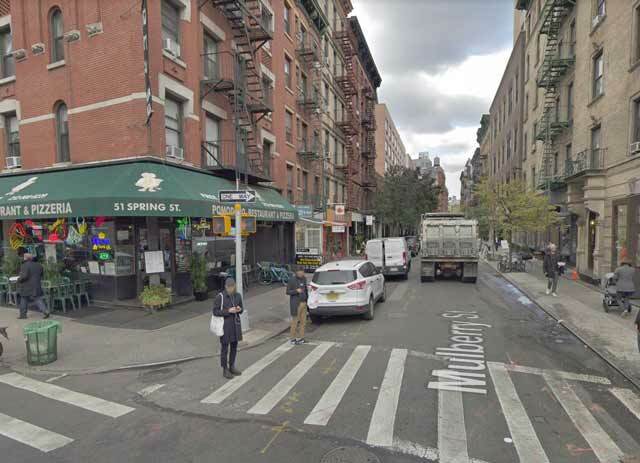 As shown in the photo below taken from Google Street View, City Diner at 163 West 23rd Street is long gone. However, what has taken its place? Why, another diner, of course. This one is called Malibu Diner. Or is it another diner, or the same City Diner with a new name? We shall soon find out. Malibu Diner is open 24/7 and generally gets good reviews. Do you want water in a glass instead of a cup? The Malibu Diner is your place. People call it a "slice of old-time New York," and our comparison shows that isn't far off the mark. The Malibu Diner is one of those places where you go to get a classic tuna melt, or maybe a Bison Burger Deluxe. Nobody will make it exactly like one of those joints, which have been perfecting their craft literally for decades - as we can see. Oh, and it also delivers - you can't beat that! Oh, the Malibu Diner is a Greek Diner, though many of the workers there now apparently are Spanish speakers. Why the owners decided to change the name to "Malibu Diner" is a bit of a mystery. In the recent photo below, you can see the entrance to 165 West 23rd Street to the left of the diner (this is on the north side of 23rd Street). The City Diner building facade doesn't appear to have been touched in the 40-odd years since the above photo from around 1978-1980 was taken. They have added an awning - well, you do have to make some concessions to the passage of time. I think the awning gives the diner a classier look, but City Diner looked just fine without it, too. The view from Selis Manor, at the right, to Malibu Diner at the left (marked by the red canopy). Google Street View. One of the secrets to why City Diner/Malibu Diner has survived is that it has a devoted clientele at nearby Selis Manor. Selis Manor is a 200-apartment building that offers special housing for the blind. Selis Manor, founded by a blind newspaperman, opened in 1980. You might notice the timing. This was right after City Diner opened, and the owners of City Diner recognized a community need that needed to be filled. Many of the visually impaired folks have difficulty chopping up their food, so they simply come down to the Malibu Diner or order delivery. Malibu Diner always plays music outside so its visually impaired patrons know that they've arrived. Malibu Diner features menus in Braille - how often are you going to find that? My friends, there's a secret to every successful business, and you just learned Malibu Diner's secret. Anyway, I hope you enjoyed this entry in "the more things change, the more they stay the same." There are lessons in the success of the Malibu Diner that wise readers will appreciate. Thanks for stopping by! 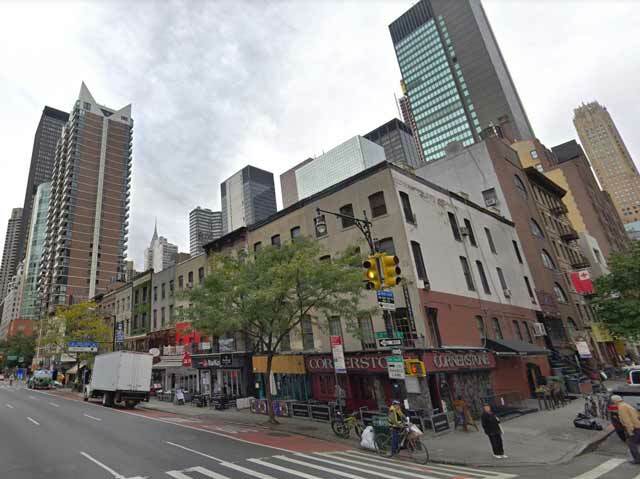 163 West 23rd Street, Manhattan in the 2010s (Google Steet View).